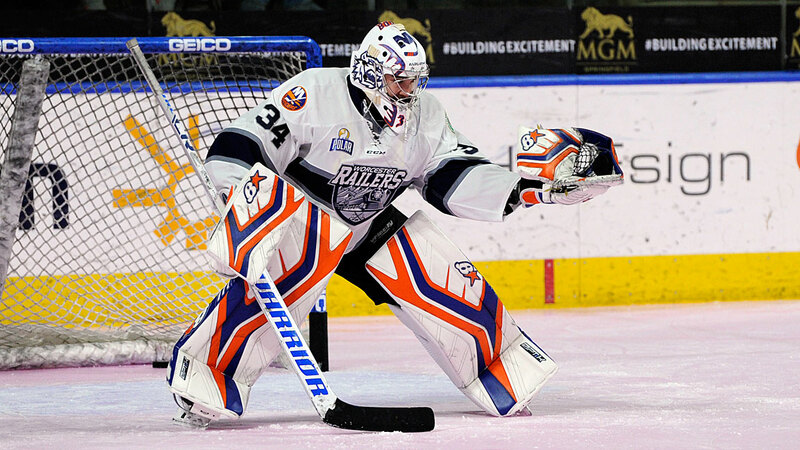 WORCESTER, MA– The Worcester Railers Hockey Club (@RailersHC), proud ECHL(@ECHL) affiliate of the New York Islanders (@NYIslanders), and Railers HC Head Coach and General Manager Jamie Russell(@JamieRusell18) has announced goaltender Evan Buitenhuis has been selected as the CCM ECHL Goaltender of the Week for the week of Feb. 11-17. Buitenhuis went 2-0-0 with a 1.09 goals-against average and a save percentage of .973 in three appearances last week. The 26-year-old stopped made 34 saves in a 6-2 win at Allen on Friday, stopped all 47 shots he faced in a 1-0 win at Tulsa on Saturday to post his first professional shutout, and stopped 30 of the 31 shots he faced in a relief effort on Sunday in a 6-3 loss to Oilers. Under an American Hockey League contract with Bridgeport, Buitenhuis is 9-8-4 in 25 appearances with the Railers this season and leads the ECHL with a .931 save percentage while ranking second in the league with a 2.20 goals-against average. Prior to turning pro, Buitenhuis played four seasons at Hamilton College, where he appeared in 68 career games and went 39-16-12 with 10 shutouts, a 1.67 goals-against average and a save percentage of .944.